Review: Wisdom, adventure, life lessons… all of these words explains Alberic the Wise and Other Journeys. There are three stories or journeys in this book. One of the stories is about one wise man, the next story is an adventure into a painting, and the last is of two kings whose lives change forever. This book has important themes to remember and help you out in life. This fiction book, Alberic the Wise and Other Journeys, is wonderful and different from most books I have read. In the first story, chapter, or journey, there is a man, Alberic, who lives on a farm. He has no knowledge. Alberic only knows how the world operates around him, such as the seasons and when grapes are ripe or not. He soon wonders what lies beyond his farm, only after an old, homeless man tells stories of wonderful towns and palaces. When Alberic leaves his farm, he takes on many jobs and fails at every one of them. After many years, he has experienced every job, and is soon known as Alberic the Wise. Another adventure occurs soon after for Alberic, and this reveals one of the important themes. The next journey is about a little boy who cares about nothing; only because he is afraid he will get too attached and will end up heart broken. This little boy, Claude, visits the art museum every day after school and on the weekends. He knows every painting and sculpture there is in this art museum. That is until one day when he spies this one small painting he has never seen before, and soon he is drawn to it. Claude gets sucked into this painting, and meets the little girl who is the subject of the painting. Next, Claude learns of a battle going on near the edge of the valley. The princess is said to cry because of the horrible story behind this battle. Claude soon becomes a gigantic part of the army in order to help the girl. Claude comes to the museum early one morning, eager to travel inside the painting once more, but finds something even more heart breaking than expected. In the last chapter, two kings, one poor and one rich, change forever. The poor king has a poor kingdom and almost all of his subjects don't even know who he is. His castle is poor, his clothes are poor, and the king, R. N. P., is constantly depressed. In the other kingdom, the king is rich and all of subjects adore and praise the king Magnus. Magnus has everything any king wants. But, both kings feel they have something missing. Both kings set out to each other's kingdoms, without knowledge of each other's existence. King Magnus' subjects are aware of King R. N. P.'s horrible kingdom and completely redecorates King R. N. P.'s kingdom. When both kings arrive at each of the kingdoms, their reactions and what they find is unexpected. What I like about Alberic the Wise and Other Journeys is definitely how unique it is from other books I have read. I don't remember reading a book with such clear life-lesson themes. Alberic the Wise and Other Journeys is different from any other book I have read. Also, the text sends an important message to its readers. This is important to have in a book because that means the book was worth reading and that you will remember it for a while. This is because when a situation comes along and you remember the important message that comes out of this book that you read and it helps solve your problem, you will definitely think back and think to yourself that this was a fantastic book. I also love the creativity it takes to explain these themes. I admire the author's way of describing the traits to each theme. It is very creative and ingenious. One negative thing about this book is at the beginning of every chapter, story, or journey, it is slow moving. It always takes a while for the plot to arrive and the meaning to come. This makes the story boring to read at times and this isn't a good characteristic for a book to have. 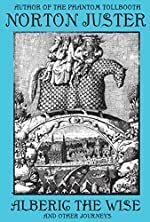 Overall, I believe Alberic the Wise and Other Journeys is worth reading over the more dull parts because it is a fantastic book. We would like to thank Random House for providing a copy of Alberic the Wise and Other Journeys for this review. Have you read Alberic the Wise and Other Journeys? How would you rate it?